MANILA, Philippines - Planning to take licensure exam for teachers (LET) this year? Did you miss the first LET in March 2017? The Professional Regulation Commission (PRC) is set to conduct the second LET for 2017 on September 24. Check out on this page for the schedule, requirements, deadline of filing applications and test program as announced through PRC Resolution No. 2016-1019. PRC will open the online processing on May 8 (Monday) with the deadline of filing applications on July 14, 2017 (Friday). The September 2017 LET will be administered in Manila, all regional offices, Zamboanga, Bacolod, Rosales, Pangasinan, Laoag and General Santos City. For Teachers in vocational and two-year technical course: A bachelors degree in the field of specialization or its equivalent, with at least 18 units in professional education. Note: For repeaters, Original and photo copies of Transcript of Records & NSO Birth Certificate (with same specifications above). All qualified applicants are encouraged to apply online. The requirements are to be submitted upon processing/issuance of Notice of Admission. View the step-by-step guide here. PRC advised that separate test booklets will be used for the General Education (GE) and Professional Education (PE) subjects for both elementary and secondary levels in the September 2017 LET. Note: Full copy of LET program will be available here once announced online. According to PRC, September 2017 LET results are target for release on November 27 or in 44 working days (65 calendar days) after the exam. This excludes Saturdays and Sundays and two holidays namely - Special non-working Day on October 31 and All Saints' Day. 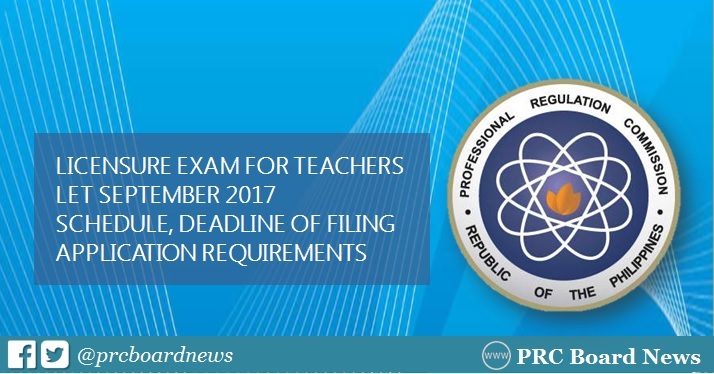 PRC Board News, as one of the trusted websites for monitoring PRC exam results will continue to provide updates for the upcoming teachers board exam.